Aris is a spectacular dressage. 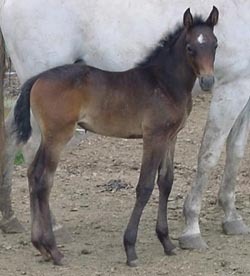 sporthorse prospect. She's sired by arakeen, a pure polish stallion with substance and tons of movement and is out of Winsome, an Oldenburg mare that was successfully show in dressage. This one will shine in the performance ring. Nominated in the AIM sporthorse futurity. No Longer Available for Sale.